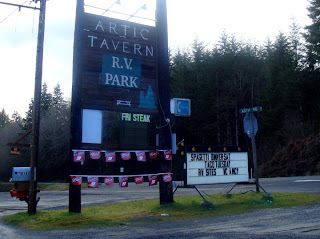 Depending on which sign you go by, this is either the Artic Pub and Smokehouse, or the Artic Tavern and RV Park. 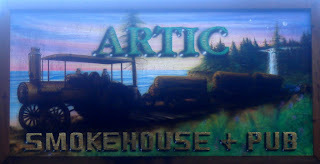 When I checked it out on a Thursday afternoon, this looked like a fine place to come in and warm up your overalls by the wood burning stove, pop a cold one, and catch the judge shows on daytime TV. But even though this is in the middle of nowhere, it looks like they sometimes get some pretty rocking bands.